While everyone's attention is focused on Ryzen at the moment, Nvidia is hoping to divert some eyeballs to its own roadmap. Over on its GeForce.com website, Nvidia has a countdown timer for what in all likelihood is an upcoming GeForce GTX 1080 Ti announcement. At the time of this writing, the countdown timer shows five days remaining. 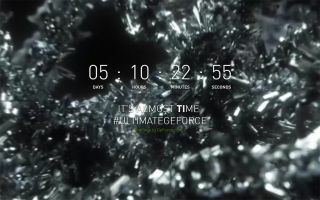 Underneath the timer it says in all caps, "IT'S ALMOST TIME" followed by the hashtag #ULTIMATEGEFORCE. The letters "TI" in TIME are bolded, which is the first major hint of what's to come. The second hint is found in the website's source code, or at least it was. According to both Videocardz.com and PCWorld, the video playing in the background is titled "GTX1080Ti_Countdown_Hero." Nvidia has since discarded the GTX1080Ti designation from the file name, but it seems as though the cat is already out of the bag. Previous rumors had Nvidia launching the GeForce GTX 1080 Ti at the Consumer Electronics Show (CES) in January, but that obviously did not happen. There is some speculation as to why, though all that matters is that CES came and went without the much anticipated card being announced. Unless Nvidia is pranking the Internet community at large, it now looks as though the GeForce GTX 1080 Ti will be announced or unveiled at GDC 2017 on the same day AMD is scheduled to host its second annual Capsaicin livestream event. AMD will talk about its next-generation Vega GPU architecture at Capsaicin, so Nvidia is certainly going to steal some thunder from the competition. As to when we'll be testing either card, it looks like the 1080 Ti will be launching first.